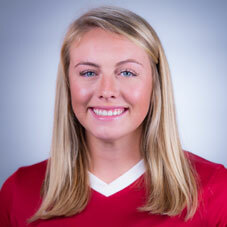 Redshirted her first year with the Razorbacks. Played for Dallas Texans club team in Texas. Rated a three-star prospect by TopDrawerSoccer.com … Named into TopDrawerSoccer.com’s 2015 Winter All-Region state team … Two-time National Elite Prep Showcase (NEPS) All-Tournament first team honoree (2015, 16) … Named into TopDrawerSoccer.com’s 2016 NEPS player watchlist … First team selection in Texas Association of Soccer Coaches (TASCO) Girls Soccer All-State 6A in 2015-16 … Honorable mention selection in TASCO Girls Soccer All-Region I 6A in 2014-15 … Three-time University Interscholastic League (UIL) Girls Soccer All-District honoree (7-6A first team selection in 2015-16 and 4-5A first team 2013-14, 7-6A second team selection and Utility MVP in 2014-15) … Named into Fort Worth Star-Telegram 2015 Super Team.